LUIS uses two keys: authoring and endpoint. The authoring key is created for you automatically when you create your LUIS account. When you are ready to publish your LUIS app, you need to create the endpoint key, assign it to your LUIS app, and use it with the endpoint query. It is important to author LUIS apps in regions where you also want to publish and query. An authoring key, also known as a starter key, is created automatically when you create a LUIS account and it is free. You have one authoring key across all your LUIS apps for each authoring region. The authoring key is provided to author your LUIS app or to test endpoint queries. To find the authoring Key, sign in to LUIS and click on the account name in the upper-right navigation bar to open Account Settings. When you want to make production endpoint queries, create the Azure LUIS subscription. For convenience, many of the samples use the Authoring key since it provides a few endpoint calls in its quota. When you need production endpoint queries, create an Azure Resource then assign it to the LUIS app. 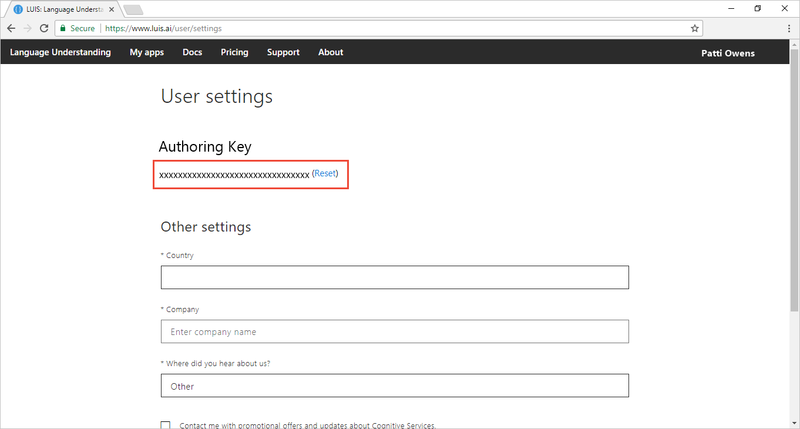 If you are new to Cognitive Services or new to Azure, create a temporary key. If you have an Azure account, create a new resource in the portal. Language Understanding endpoint queries support two Azure Resource types: Language Understanding or the Cognitive Service resource. You need the name of the resource when you assign the key to the app. When the Azure resource creation process is finished, assign the key to the app. * The endpoint key allows a quota of endpoint hits based on the usage plan you specified when creating the key. See [Cognitive Services Pricing](https://azure.microsoft.com/pricing/details/cognitive-services/language-understanding-intelligent-services/?v=17.23h) for pricing information. * The endpoint key can be used for all your LUIS apps or for specific LUIS apps. * Do not use the endpoint key for authoring LUIS apps. Change your endpoint query value for the subscription-key from the authoring (starter) key, to the new endpoint key in order to use the LUIS endpoint key quota rate. If you create the key, and assign the key but do not change the endpoint query value for subscription-key, you are not using your endpoint key quota. Change your endpoint query value for the Ocp-Apim-Subscription-Key from the authoring (starter) key, to the new endpoint key in order to use the LUIS endpoint key quota rate. If you create the key, and assign the key but do not change the endpoint query value for Ocp-Apim-Subscription-Key, you are not using your endpoint key quota. The app ID used in the previous URLs, df67dcdb-c37d-46af-88e1-8b97951ca1c2, is the public IoT app used for the interactive demonstration. The LUIS APIs use the header, Ocp-Apim-Subscription-Key. The header name does not change based on which key and set of APIs you are using. Set the header to the authoring key for authoring APIs. If you are using the endpoint, set the header to the endpoint key. You can't pass the endpoint key for authoring APIs. If you do, you get a 401 error - access denied due to invalid endpoint key. See Key Limits and Azure Regions. The authoring key is free and used for authoring. The LUIS endpoint key has a free tier but must be created by you and associated with your LUIS app on the Publish page. It can't be used for authoring, but only endpoint queries. Publishing regions are different from authoring regions. Make sure you create an app in the authoring region corresponding to the publishing region you want. If you exceed your per second quota, you receive an HTTP 429 error. If you exceed your per month quota, you receive an HTTP 403 error. Fix these errors by getting a LUIS endpoint key, assigning the key to the app on the Publish page of the LUIS website. You can assign the endpoint key in the LUIS portal or via the corresponding APIs. Learn concepts about authoring and endpoint keys.